Anyone familiar with the geography of the Pogamasing knows the area is a wonderland of waterways for canoeists. It was the Anishnabe who first opened up the area by making nastawgans, their winter and summer travel routes. As the Anishnabe returned to their winter hunting grounds in the fall up the Spanish River they would have noticed the creek from Lake Pogamasing. The short distance up the creek between the Spanish and the lake was only a kilometre, so it was easily reached. Once into the lake, an entry point to the inland lake system was a mere kilometre away through Little Pog Creek. From there they could access a multitude of lakes all the way north to Biscotasing and if desired, use the access to the waterways to James Bay. Of course, it was also possible to travel to Bisco up the Spanish, but the inland waterways through Pog provided an easy alternative, especially when water levels on the Spanish were high and difficult to navigate. 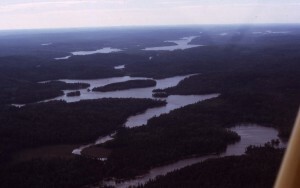 To the south of Lake Pogamasing, Kennedy Lake is an easy portage from Pog over a former tote road. Kennedy leads to Bluewater, Franklin, Trembley and eventually back to the Spanish via the Mogo Creek south of Bluewater. Older maps show there were portages to the east to Onaping, one of the larger lakes in the Spanish watershed. It’s no wonder Pog was chosen as the site for the first inland trading post given it was a natural hub for the upper Spanish River. It wasn’t until I saw Pog Lodge’s map of the area in the late fifties that I became fascinated with all the possibility of travelling to these interconnected lakes. 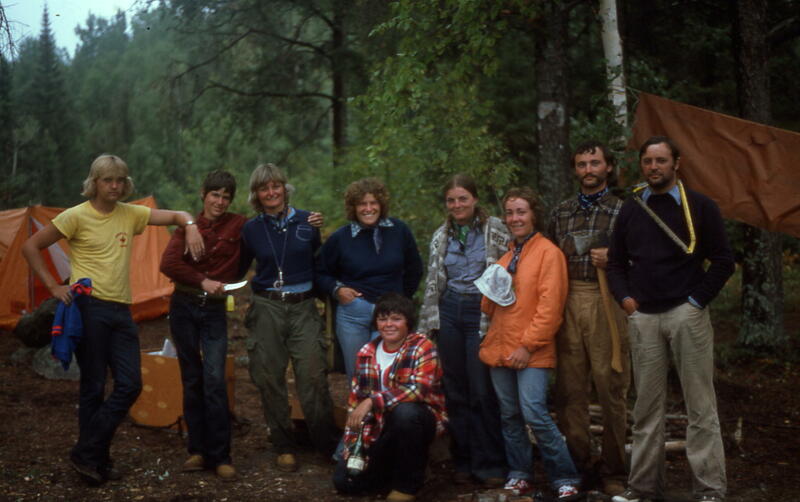 My first summer job as a guide for Pog Lodge took me into their inland fishing camps on Little Pog and Little Squirrel Lakes. Surprisingly, I didn’t really get into canoeing until much later and it was through these trips that the history of the area became so apparent and interesting. 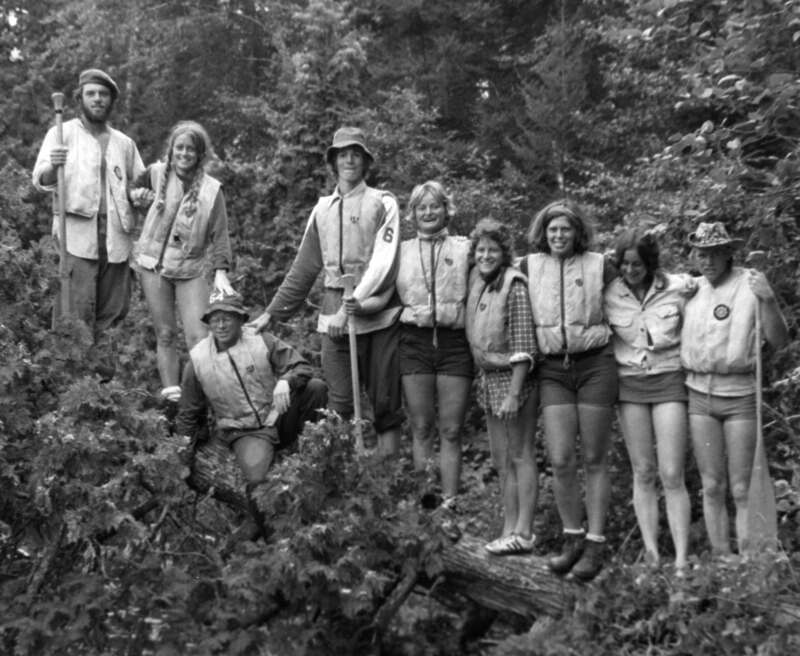 In 1972 I began to operate canoe trips from our family camp on Pog. My uncle, Bill Plaunt, flew me over the most difficult sections, the route from Pog to Mohzabong, a series of small lakes. Fortunately from the plane, I was able to view the route. He also showed me the portages and tote roads that he used when he was the walking boss for his father’s logging camps throughout the Little Pog and Sinaminda Lakes during the 1930s. Logging operations starting back as early as the 1900’s used these trails to access their camps. They also built tote roads but they were not always appropriate for portaging. Knowing where to go on my trips was the easy part, however, as I quickly discovered that some of the old portages were overgrown (especially the longer ones!) and had to be rediscovered and underbrushed. Despite all the hard work, what I saw while camping and portaging peaked my interest. Old dams, logging camps and booms chains were to be found everywhere. With my curiosity aroused, I returned to the person whom I knew could flesh in the details. That Christmas I interviewed my Uncle Bill about his experiences working in the logging operations. His colourful and thorough description was so good I’ve included it as a chapter in my book, ‘Lumbering in the 1930’s’. I also learned my uncle had taken movies of the complete operation, from cuttingand hauling in the fall and winter to driving the rivers and milling in the spring and summer. I combined the movie and the interview and it can be viewed from this website (VIDEO ON LUMBERING). To return to the canoe trips. What made the primary trip, from Pogamasing to Biscotasing so practical was that once at Bisco, there was a natural return route down the Spanish River. 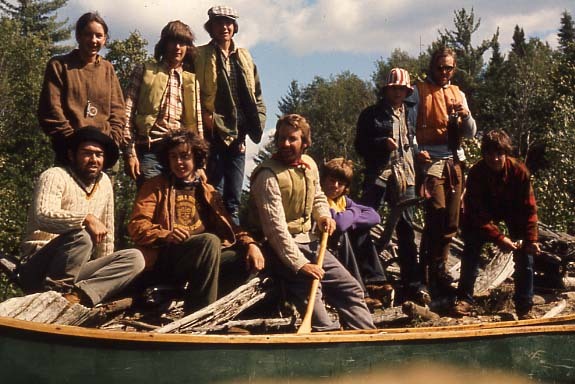 Many of my trippers, students and adults, had little canoeing experience, but they could learn to paddle on the lakes on the early part of the trip and then, once instructed in whitewater canoeing at the Spanish dam on lake Biscotasing, paddle down the Spanish, back to Pog, or all the way to Lake Agnew. Recent canoeing adventures in the last few years now include searching for signs that indicate which companies logged in the different lakes. The archival records are not always clear where each company cut their trees, but they did leave one tell tale sign, their timber stamps. Logging companies were required to stamp each log with a hammer-like instrument that imprinted their company logo on the end of each log. They needed several stamps at each end in order for them to be identified for the sorting jacks at the mouth of the Spanish River. 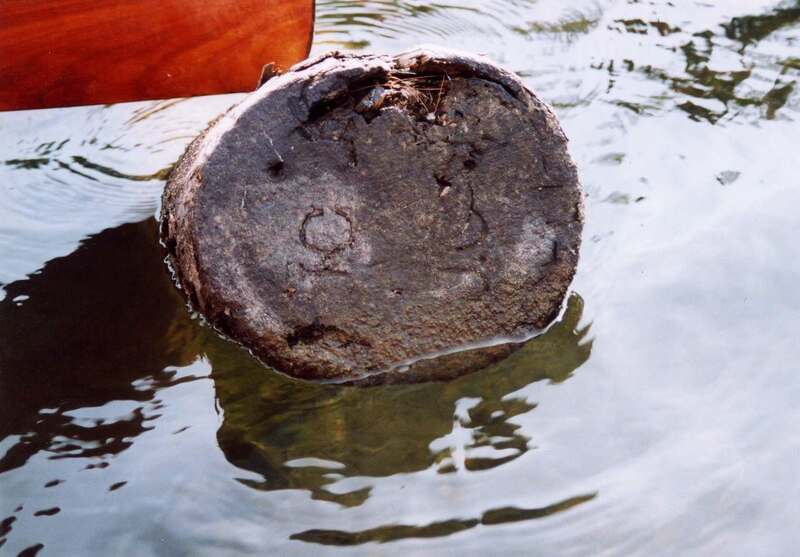 As Mandy and I have canoed in the many lakes around Pog we have been able to find logs representing almost every company that logged here. You may wonder why these companies left the logs. Most that we’ve found had lost their buoyancy and were sitting with one end on the bottom and the other just above water. Individual logs weren’t worth spending the time to drag along, especially when they were dealing with thousands. So thanks to my canoe-tripping experience in the upper Spanish watershed the history of the area became a strong interest and led to the publication of this book. I am excited to read more about your discoveries in the Pogamasing community. You are our guide and mentor on this journey. My experience on your canoe trip of 1974 has had a life long impact; stirring my desire to explore natural environments by canoe and kayak. Looking forward to the book! It’s always been a pleasure to take people like you who derive a similar enjoyment from the wilderness. Hopefully this book will add another dimension to your experience. 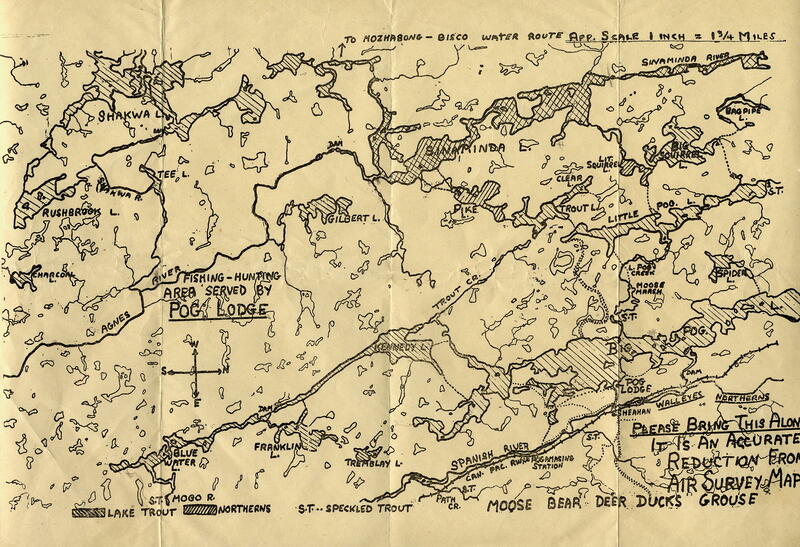 I am doing a little research and am looking for maps which show the portage routes from Pogamasing Lake to Onaping Lake. You mention in “canoeing into the past that there are maps that show these portages. Is there somewhere I can obtain copies of these maps? 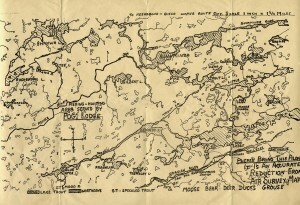 The map where I saw the portages is not very clear as it is a large Lands and Forest map of the Sudbury and Nipissing Districts (1954 – scale 4 miles to an inch). The trail is very poorly shown with only ‘P’s’ used and a few dots to indicate where the portages existed between a number of small lakes. What seems to be a trail between the two lakes – probably was used when there was a trading post on Pog. It appears to start near Flourite (CP stop) – but there is a big gap from here to Path, then to Elboga, Muldrew, Twisted, possibly Sugarbush and then Onaping. I think you could a better job looking at Google Earth and see where the natural portages were. GE also shows the network of logging roads in the area so that might help or be a problem. I have also heard from a local resident that told me that a Native trapper used to use this trail to come to Pog from Onaping. just to get salt, although I’m not sure from whom. I doubt you will find much of a trail today as many trails I used in the seventies to travel from Pog to Little Pog are now overgrown. I also have more maps at Pog and when I go there this summer I’ll have a look and get back to you. My apologies for not replying but for some reason I have not been getting comments. If you’re still interested I can help you, for next year. Once again, fantastic website… such an incredible amount of detailed research. Have a Merry Christmas and I look forward to seeing you in the new year!